Young Americans Schools of Self-Defense - Send us a message or question on our program or classes. We love to hear from you, you can contact us by completing all fields below or calling us at 952-997-7732. Thank you! For class schedule and locations check out our Schedule/Location Page. 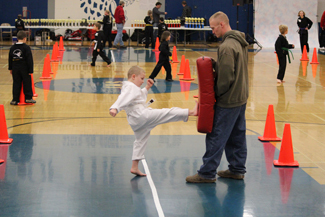 This student is warming up by practicing his kicks prior to a tournament. 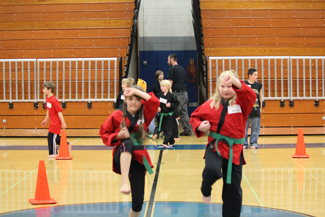 These students are practicing thier Kata (or form) prior to competition at a tournament.